Finally. Love at first bite. With fake cheese, no less! 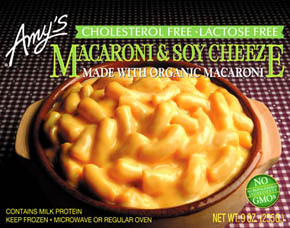 Amy’s Macaroni & Soy Cheeze, made with organic pasta, cholesterol free and lactose free, is the best brand I’ve found yet for that almost-the-real-thing taste I’ve been craving. Thick, deliciously gooey cheeze liberally covers generously-sized noodles, and if you heat it up just a little bit more than the directions, you get that wonderfully crisped taste along the edges. It does have caseinate in it, so die-hard macrobiotics should avoid it. The reason I chose it over its non-caseinate, perfectly friendly rice pasta mac & fake cheese neighbors in the freezer was because I am sick of non-caseinate rice pasta attempt that taste like warmed-over pressed cardboard. And yes, I can make my own with meltable fake cheese and a package of organic noodles; I can also try to get enough sleep and still do all the things I want during the work week. Ah, ideals. I can’t say enough about how marvelous this tasted. I know I’d found a good enough substitute prior to this, and I’m certainly not knocking that, but this not only almost tastes like the real thing, it actually looks like the real thing. Note: Contains wheat and soy. And here’s a little more about caseinate. Pingback: Tastebud Satisfaction: Amy’s Rice Macaroni with Cheeze « Career. Food. Environment. Stuff.